Visualizations in contracts are gaining momentum as businesses seek greater clarity to boost their brand, increase efficiency, effectiveness and transparency. A new experimental study shows how it's done - and its surprising benefits for non-native speakers in helping bridge the language barrier. Conducted by Aalto University in Finland -- in collaboration with IACCM - the study shows that visuals are changing our contracting world. What follows are results and analysis by researcher and author, Stefania Passera. 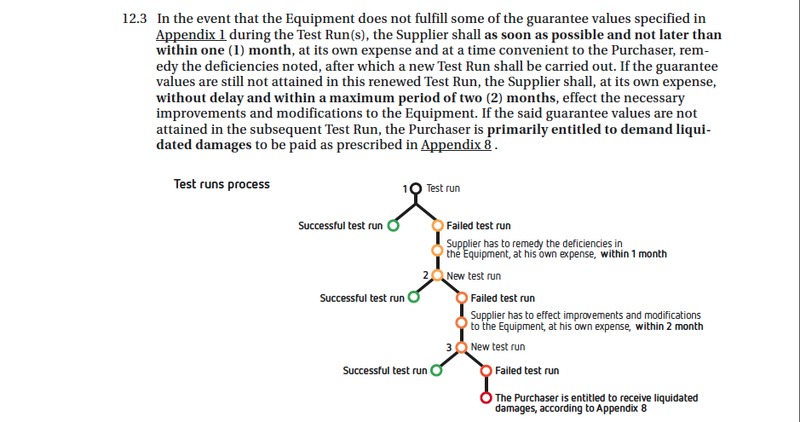 This article helps you visualize how you can use diagrams, charts and icons in commercial contracts - transforming them into tools that create value – with evidence that visual contracts can help non-native speakers to understand the contract as accurately as native speakers. Visuals can also reduce the “cognitive load” for contract professionals: with their workforce more engaged in reading contracts, organizations can achieve better results with a fraction of the time and effort usually required. 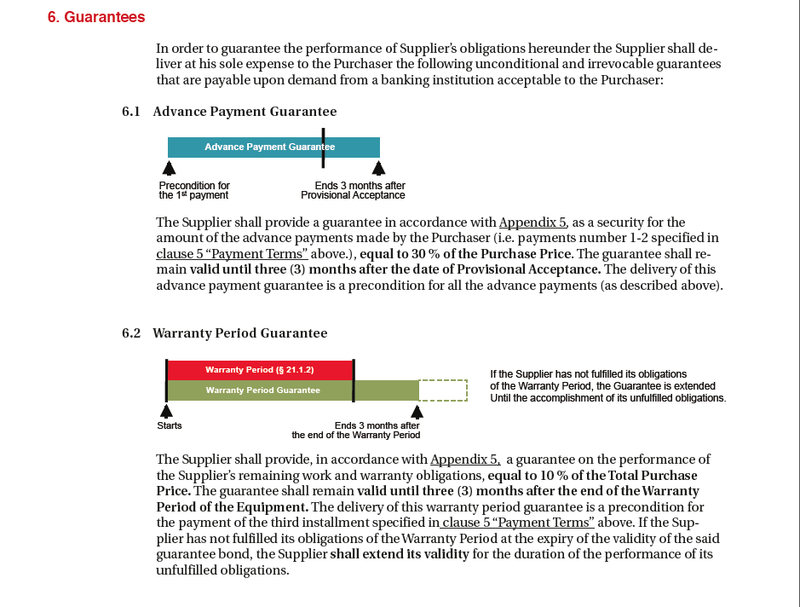 Some organizations see contracts as “necessary evils,” taking a lot of time and effort, and sometimes so complex they are misunderstood (or not read), even by key people. But, as we know, this can result in costly mistakes, non-performance, sour business relationships and even litigation. Prototypes, experiments and examples then become crucial in helping businesses to understand if and how to harness the power of visual communication. For this reason, I organized an experimental study, in collaboration with IACCM, to test whether contracts that have been enriched with visuals are more understandable, faster and more pleasant to read than traditional contracts. The study took place online in May 2014, and IACCM helped to reach out to participants and organize webinar info-sessions. A total of 124 IACCM members from 24 countries took part in the study. All were provided with a contract, either in a traditional, text only format, or a visually enriched version, and asked to answer six questions to test their comprehension of the text. A number of additional questions were asked to assess the perceived difficulty of the task and their user experience in relation to each type of contract. The contract used in the experiment was a B2B agreement on the purchase of equipment. Sensitive information included in it was fictitious, but all visualizations were developed for a real-life contract of a Finnish industrial company participating in the UXUS Research Program1. Clarify key parts of the text using charts, diagrams, timelines and flowcharts. The experiment assessed how well participants had understood the contract by measuring their speed and accuracy in answering a series of comprehension tasks. The research participants were divided into two groups, one using the traditional, text-only version of the contract and the other a visually enhanced version. The wording and structure remained exactly the same, to ensure comparability. Using the visual version of the contract the participants could, on average, reply correctly and faster to more questions. Differences in accuracy and speed between the two groups are statistically significant, evidence that the visual display of contractual information has a positive effect on comprehension. Daunting task may be easier than you thought! The two groups were also asked to subjectively assess the difficulty of using their assigned contract version both before reading it (expected difficulty) and after (effective difficulty), via the comprehension task. The “before task” measure was taken to demonstrate whether the two groups differed in their expectations or preconceptions about the task difficulty, based on their previous experiences with contracts. 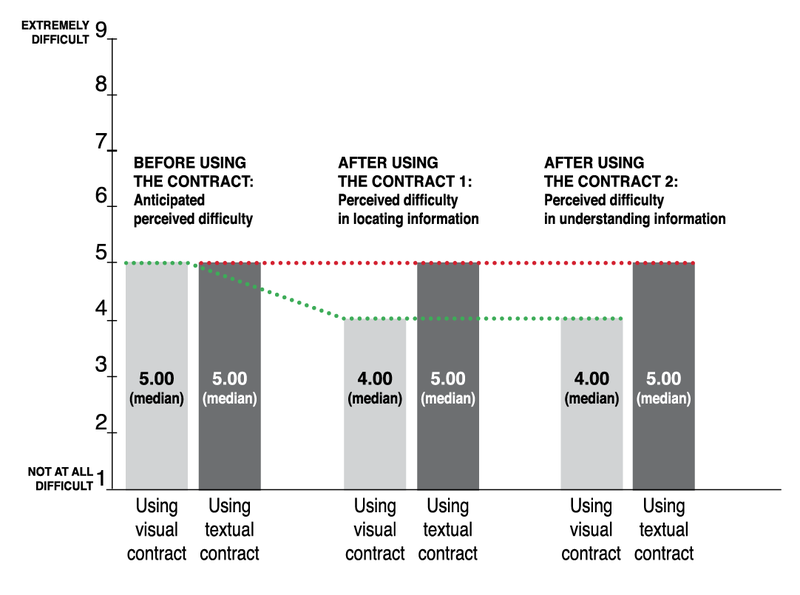 While there was no difference between the expected and effective difficulty experienced by the group working with the traditional text-only contract, the group working with the visual contract experienced less difficulty than they had expected. This suggests that the visual version of the contract provides a better user experience than traditional contracts. 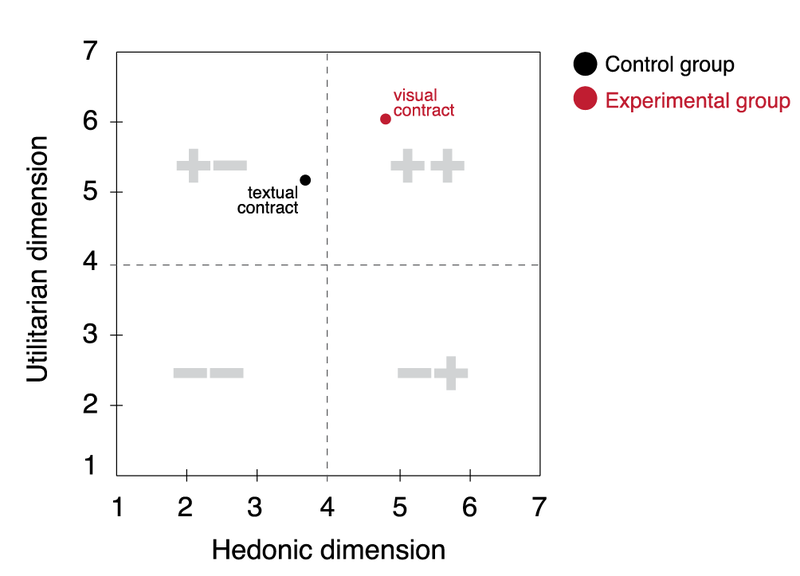 A very interesting result of this study emerged by statistically analysing the interactions between different variables: that visual contracts can help non-native speakers to understand the contract as accurately as native speakers. This has significant implications because, now that English is the principal business lingua franca (used it in its infinite local variants, more or less skillfully),very often, both contracting parties rely on English, even though none of the negotiators or contract managers are English native speakers. Visual communication, apparently, can also help us avoid the pitfalls of spoken and written English (and legalese). As expected, native speakers display a more accurate understanding than non-native speakers when reading a traditional textual contract. However, the comprehension accuracy of the two groups is statistically equal when using a visual contract. Moreover, even native speakers are more accurate in the comprehension tasks when using a visual contract. This strengthens the position for using visuals beyond text-only content. Contract visualizations can also prevent misunderstandings and enhance clear communication in international and domestic contracts. Statistical analysis shows that comprehension speed and accuracy is not affected by cognitive style2 (the favorite thinking style of each person, who can be categorized as a verbalizer, or a visualizer), their level of education or whether they have a background in law. This means even highly educated people and jurists perform better with a visual contract! The experiment featured six comprehension questions, so a perfect accuracy score would be six points (1 per correct answer). And what about user experience - the overall evaluation of the readers' interaction with the contract, emerging from, and at the same time feeding, the readers' perceptions, emotions, predispositions and motivation to read3? User experience might seem a “soft” value, which has not much to do with “serious” business tools as contracts. However, in our professional roles we remain human beings, with feelings and values, with a need to be engaged and motivated by meaningful interactions with people and things. Research has shown how positive experiences contribute to purchasing decisions and creation of strong, successful brands4, so the power that comes with designing positive experiences should not be underestimated, even in a B2B context. We would never accept a poor, unclear, cumbersome, frustrating, boring user experience from our smartphones, so why do we let our contracts “mistreat” us? 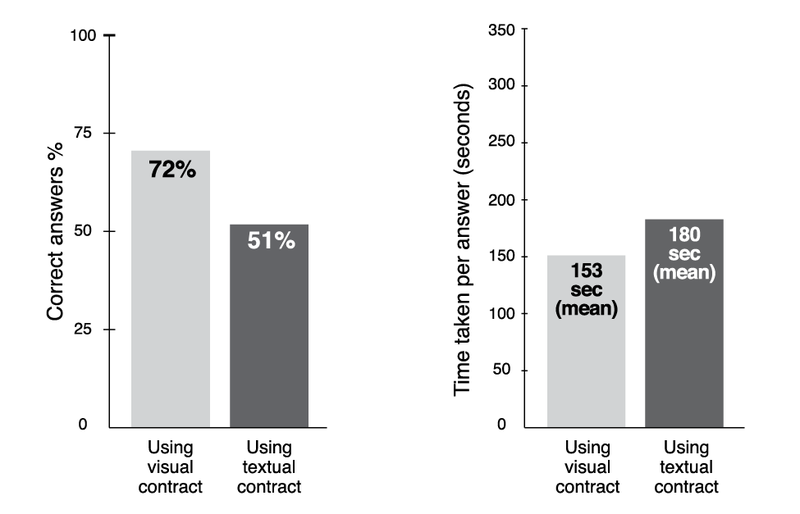 Visual contracts outperform traditional textual contracts in two ways. Firstly, we look at the score on the PANAS scale, which is a measure of positive and negative emotions elicited by a specific event, ranging from 5 to 25 points 5,6. The visual contract elicits more positive emotions (eg inspiration, determination, alertness) and fewer negative ones (eg hostility, frustration, shame) than the textual contract. Secondly, we look at the score on the HED/UT scale, which is a measure of two dimensions that contribute to a user's positive attitude7: The first dimension is the hedonic, deriving from the gratification and pleasantness of the experience, and the second is the utilitarian, arising from the satisfaction of instrumental, functional needs. The two dimensions are considered at once, creating a matrix: the top-right quadrant is the optimal positioning, where we find pleasant and useful products. Other products might be either pleasant or useful, so the other dimension has to be strengthened. Products in the bottom-left quadrant are neither pleasant nor useful, so serious rethinking would be needed! 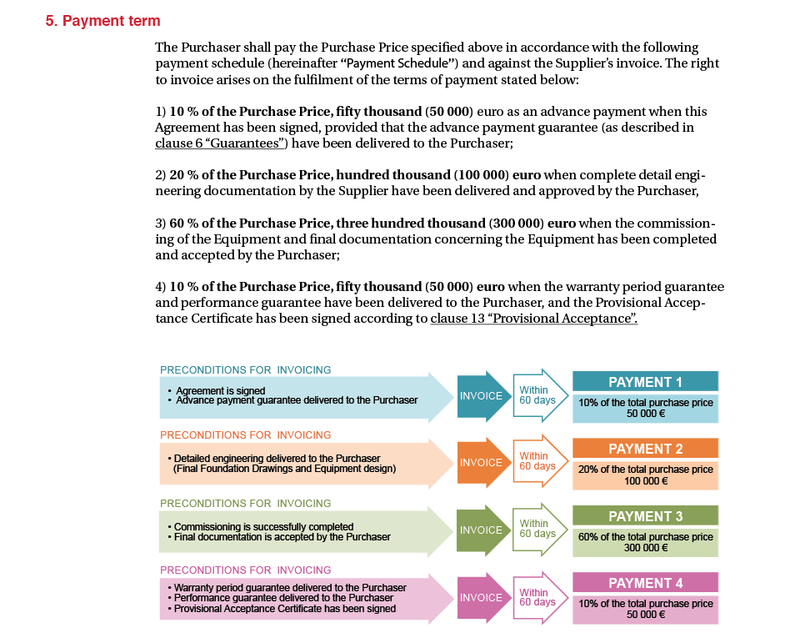 Since we are using English as a business lingua franca (often when none of the parties is a native speaker), misunderstandings and inaccuracies are common in contracts. Visualizations can help clarify and restrict the meaning of the contract text, furthering clear communication between the parties, helping them saving time during drafting, revision and negotiations, and avoiding costly mistakes down the road. Visualizations can reduce the cognitive load experienced by contract professionals, so organizations can ensure that their workforce is more engaged in reading contracts, achieving better results at a fraction of the time and effort usually required. Visualisation also improves the overall experience of contracts, possibly boosting the brand of an organization as it communicates values such as transparency, openness to collaboration, and innovativeness. 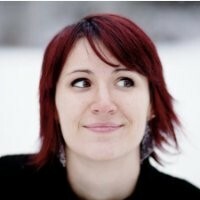 Stefania Passera, MA, is a Doctoral Researcher researcher in MIND Research Group, a multidisciplinary team at Aalto University School of Science, Helsinki, Finland. She has a background in graphic design, and since 2010 she has been researching and experimenting with the topic of contract visualization. The goal of her work is to make contracts clearer, easier and user-friendlier through visualizations that can help readers to make sense of complex information. Stefania has been working with private and public organizations in Finland on the development of user-centered visual contract documents, redesigning and piloting new generation visual contracts. She is also a freelance designer, university lecturer and the initiator of the international series of events Legal Design Jam (www.legaldesignjam.com). Her paper “User-Centered Contract Design: New Directions in the Quest for Simpler Contracting” (co-authored with Helena Haapio, PhD) was awarded Best Paper at the IACCM Academic Forum 2011.